Looking for an upgrade from Thai Place? Soi 38, which is owned by the former campus favorite, is a great place for adventurous Thai food. Moo yang kati sad (grilled pork belly) makes a great starter. In September, we bid Thai Place, and its convenient location on the campus border, farewell. But just a short walk away, on 21st and L streets, is Soi 38, an upscale version of Thai Place that opened in April. Owned and operated by Nat Ongsangkoon and Dia Khanthongthip, the previous owners of Thai Place, Soi 38 integrates the more basic Thai Place favorites, like the classic pad thai, with more elegant and adventurous Thai street food. And the menu isn’t the only part that got an upgrade – Soi 38’s dark interior is offset by intricate gold paintings of dragons that swirl around the walls and across the ceiling. Behind the bar, a giant dragon’s eye peers over backlit bottles. 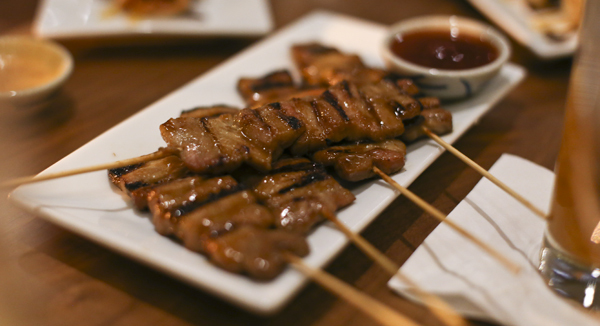 For starters, try the grilled pork belly skewers (moo yang kati sad, $8) and the ped roti ($8). Though pork belly might not be your No. 1 choice, the skewers come charred from the grill and covered in a sweet teriyaki sauce, making them taste like a normal piece of pork with a slightly chewier consistency. The ped roti is a combination of roasted duck, cucumbers and scallions wrapped in a shell made from roti – the Thai equivalent of pita bread. The shell is slightly sweet, offsetting the salty duck meat and the yellow mustard drizzled across the top of the roll. When choosing a main course, instead of jumping straight for the chicken pad thai – though I know it’s tempting – branch out and sample a wider range of Thai flavors. For noodle lovers, you can’t go wrong with the khao soi ($14), a big bowl of wide egg noodles, spicy khao soi curry and two full chicken legs floating in a rich cream sauce. The chicken falls right off the bone as you scoop out the noodles, and the full legs give the dish an authentic feel. Combat the spicy curry with either the thai iced tea ($3) – a blend of sweet dark thai tea paste, which sinks to the bottom of the glass, and cream – or the lime ginger fizz ($5) – a house blend of homemade ginger and lemongrass syrup, soda water and lime. Perhaps the most elegantly prepared dish is the khao pad sapparod ($16) – pineapple and shrimp fried rice served in a hollowed-out half of a pineapple. The sweetness of the pineapple is absorbed by the rice, making this the perfect meal for someone who doesn’t want all the spice of a curry dish. And for dessert, save yourself some trouble and just get the sweet sticky rice. Soi 38 has two options: the khao neaw saungkaya ($6), a pile of warm sticky rice covered in a thick green layer of egg custard, and the khao neaw mamuang ($7), sticky rice with mango and coconut milk. For the winter months, when mango isn’t as fresh or in-season, opt for the egg custard – it’s just as sweet and offers the same smooth texture as a ripe mango.